We are confident that with our technical expertise and the highest quality products on the market, we can supply a highly secure but easy to use access system completely bespoke to the end users need. Our range of access control systems can usually be retrospectively installed to existing doors allowing you to make any door secure in a cost effective way. What type of access control does Entrance Access Solutions offer? Entrance Access Solutions can offer any type of access control systems for your business. From standalone access control with just one single door, to full projects where the access control is monitored through a pc-based solution, we have the skills and tools to help implement any of these for your project. What is a keypad entry? A keypad entry system allows you to set a four or even six-digit number that you would press to unlock an electric door lock, to allow you access. A fob is a small device like a plastic key ring or a bank sized card that allows you to electronically unlock a door. Key fobs, which are also called hardware tokens, can be used to provide on-device, one-factor authentication to objects such as doors. Key fobs are among a class of physical security tokens that include smart cards, proximity cards and biometric keyless entry fobs. The user can present the fob to the reader beside the door which in turn will unlock the door. 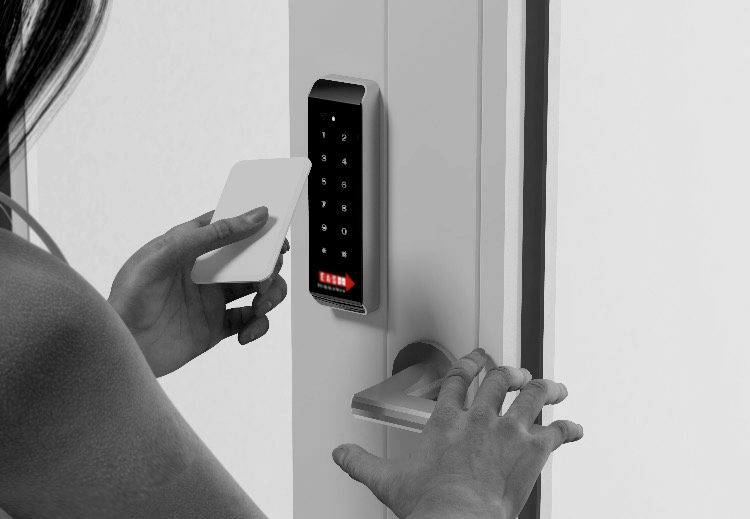 What other access control devices do EAS offer? EAS regularly installs a host of other electronic and biometric identification systems. From video and telephone entry systems to fingerprint and eye recognition, we can install whatever is most appropriate and cost effective for the entry system in question. Let’s say, you have an entrance that is not manned but has to be secure at all times, we can install a video entry system that allows visitors to press a call point and someone in another location can see the person, using a screen or mobile device, and grant them access. How does a fingerprint entry system work? A fingerprint reader is normally located beside a door. Anybody who has been granted access has their fingerprint loaded onto a database of approved people. If someone wants to use the door they need to present their finger to the small stamp-sized reader, that will read the fingerprint, check it against the database of people who have been approved for access and then unlock the door for you. What happens with Electronic Access Systems in the event of a power cut? There are a number of solutions that we can implement, depending on what sort of building and door it is. For example, if there is a power cut, the door can be set-up so that it remains secure, meaning it will stay locked. Or we can set up locks that are failsafe so that in the event of a power cut, the doors will unlock, ensuring people can get out in case of an emergency. Battery backups can also be fitted. Usually this sort of system will keep you going for around 8 hours on power, which will keep the lock secure and the door fully functional. What different types of locks does Entrance Access Solutions supply? We can supply you with all types of locks to suit your property and entrance requirements. These include: mag locks, sheer locks, strike locks, electric panic bars, electric deadbolts and latches. All of these locks have their advantages, depending on the environment they are in, doors they are used on and what their purpose is. For example, electric panic bars are great for doors that need to be secured in the event of a fire or emergency. They are very easy for users to exit the premises from. There are many other safety devices that we can offer as well. In fact, all locks can be fitted with green emergency break glass units, so that they can be pressed in an emergency and then the doors will unlock, and the user will be able to manually open the door, or it may even open automatically for them. What is a Mag Lock? A mag lock is a magnet that is constantly powered, and it connects to a strike plate that is fitted to the door. Anytime that lock is energised, it becomes a magnet, which then connects to a strike plate that is mounted on the door. They are very strong and can bear up to 1,200 pounds of pressure being applied on the door, before the lock will give. Once the energy is taken off of the lock it will unlock. This could be done via a push-to-exit button, a fob reader or other types of entrance solutions. The release can also be set to accommodate a predetermined amount of time, this could be anything from a second to for example 180 seconds. What is a Sheer Lock? A sheer lock is a variation in a mag lock. A mag lock is generally fitted to come off the transom of a door and the stripe plate is physically fitted to the front face of the door. A sheer lock is just a variation of a mag lock that is fitted in the head of the door. When the lock is energised, the magnet part in the lock draws up a locking plate from the top of the door, which in turn keeps the door secure. What is a Strike Lock? A lot of doors will have a strike lock installed and you wouldn’t notice that it had an electric lock on it. It looks almost like a standard lock keeper and it is used with a standard door lock. You can use almost any latch lock with this product. It is a releasable catch that, when the door is shut and locked, holds the door latch in place. As soon as it is de-energised or energized, it can work either way, the small latch releases and allows the door to be pushed past the latch. What are Electric Panic Bars? We install a lot of electric panic bars all over Glasgow, Edinburgh and further afield in Scotland. Electric panic bars are usually used in offices, schools and hospitals. They are just like a standard panic bar that you would find on any fire exit door, in the event of an emergency, you push the bar and the lock will unlatch in order for you to exit. However, an electric panic bar is fitted with a solenoid or a small motor, when the solenoid motor is powered through either a push button, a fob or a keypad access, then the locks retract and you can use the door to gain access into the premises. What are electric deadbolts and latches? Electric deadbolts are a style of lock that can be fitted onto almost any door in a variety of ways. Electric deadbolts are usually completely concealed, so you cannot actually see the locks on the doors. You will generally find this type of lock on very high security door systems due to the high pressure loads need to absorb. These locks can usually withstand as much pressure as a mag lock or a sheer lock, but they are more aesthetically pleasing. In order for Entrance Access Solutions to give you a quick price estimate we only need to understand a couple of basic pieces of information. What is the door going to be used for? Where is the door situated? What security features do you require? Are there any restrictions we should be aware of? Certain locks will only work on certain doors. For example, a mag lock requires a minimal clearance in height as it hangs from the transom of the door. But generally speaking, it just depends on what application you are looking for. Access Control Systems can generally be quoted on without the need for an on-site inspection.